Carter Dome is the southern most mountain in the Carter Range sitting high above Carter Notch and across from Wildcat 'A' Peak. The summit has obscure views at best, there used to be an old fire tower that was taken down several years ago taking away the magnificent views. To reach the summit from the west via Pinkham Notch (Route 16) is by the Nineteenth-Mile Brook Trail and then a steep climb up the Carter-Moriah Trail or hiking the Nineteenth-Mile Brook Trail and Carter Dome Trail. From the East (Wild River Wilderness) the Black Angel Trail and the Rainbow Trail are remote, beautiful, and provide easy grades although longer mileage wise. -Nineteeth-Mile Brook Trail and Carter-Moriah Trail: 5.0 miles 3,500 feet elevation gain. The Nineteenth-Mile Brook Trail has easy to moderate grades and good footing most of the way and is a very popular trail as it ends at the Carter Notch Hut. The Carter-Moriah Trail asecends north 1.2 miles and 1,550 feet from the Nineteenth-Mile Brook Trail, the trail is very steep at first then ascends moderately and has rough and rugged footing but there are great views down into Carter Notch and across to Wildcat 'A' Peak from outlooks. 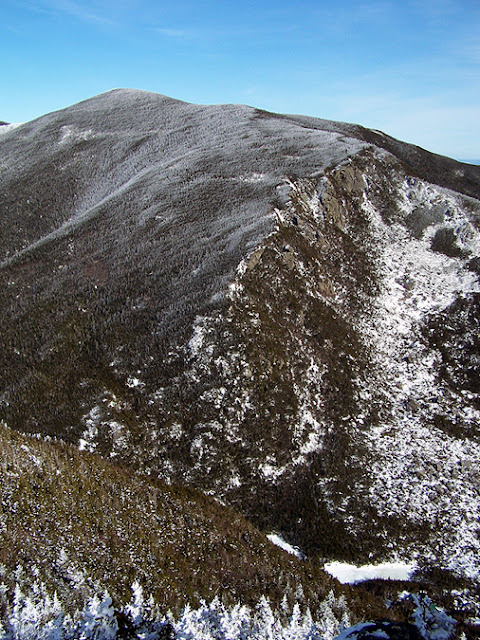 -Carter Dome Trail: 5.0 miles, 3,400 feet elevation gain (via Nineteenth-Mile Brook Trail). The Carter Dome trail has easy to moderate grades with good footing, there are a series of several short switchbacks!